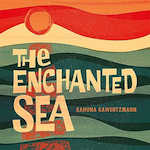 This one track mp3 single from Kahuna Kawentzmann is a fine surf treatment of a long-forgotten classic bit of Hawaiian exotica. This is a splendid surf treatment of The Islanders' "The Enchanted Sea." This is original, with a more garage atmospheric sound, and yet it retains the moody intent of the original. The spooky clarinet I think, which when combined with water-drop tweakiness, yields a mysterious and inviting soundscape. Very cool! The original is superb, and yet has only seen only a couple of surf covers (Drew Weaver and the Alvarados, The Cocktail Preachers, The Quests, and Takeshi Terauchi and the Blue Jeans.